Is the Dow Jones' Drop the Start of the Next Stock Market Crash? Subject: Is the Dow Jones' Drop the Start of the Next Stock Market Crash? The Dow is in the middle of a 1,200-point slide over the last week, which has investors wondering if this is the start of the next stock market crash. To help Money Morning readers make sense of the recent decline, we want to show you exactly what's driving the Dow Jones Industrial Average's fall and what it means for your money. Today, we'll examine two of the key factors responsible for the Dow's fall and if it signals the start of a larger downturn. As tech stocks fall in the face of mounting downward pressure, many investors are concerned that this week's drop in the Dow Jones Industrial Average is on the beginning of a coming stock market crash. There are two key factors that could turn these fears into an unpleasant reality. The first is continued escalation in the trade war between the United States and China. The latest trade war valley is weighing on stocks this week. Last Sunday (Oct. 7), Beijing announced that it intends to cut China's reserve requirement ratio by 100 bias points. This means that Chinese banks will have to keep far less cash in reserve than they have traditionally. Experts argue that this surprise move by China is intended devalue the nation's currency. On the whole, they're right – the ratio cut is expect to dump $750 billion yuan into China's economy. That's roughly $109.2 billion American dollars. With more money flowing through the Chinese economy, Chinese goods and services become less expensive relative to American goods and services. That makes China more competitive on the global market and harms American industry. However, the government's ratio cut is also a flashing red light for the Chinese economy. A cash injection of this magnitude indicates that China's economy is slowing due to pressure from recent American trade measures. China is the world's largest developing economy and the United States' largest trading partner. Any breakdown of Chinese economic growth will undermine the global economy's health. And the threat of that breakdown is sending the Dow Jones Industrial Average into the red. Second, higher interest rates are also fueling the Dow's drastic decline. That's because interest rates often create resistance for future economic growth. You see, companies that need to borrow in order to fund their growth are required to use more of their existing capital to fund that growth when interest rates rise. As a result, they have less money on hand and tighter margins. And this can prevent them from making the kind of investments that spur economic expansion. In spite of these pessimistic indicators, it is still too early in the market's decline to know if this week's significant losses are the first signs of a stock market crash. Remember, a stock market correction – at least a 10% decline in stocks – is entirely normal and even healthy for markets. And we simply won't know if this is the start of a 2018 stock market crash or is simply a short-term downturn until it's too late. That's exactly why you should be prepared for either scenario. 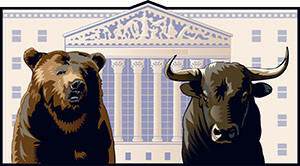 Fortunately, now is the perfect time to follow our stock market crash protection plan….